The seven layer dip I make every year for the Super Bowl is classic with olives on the top and refried beans on the bottom. 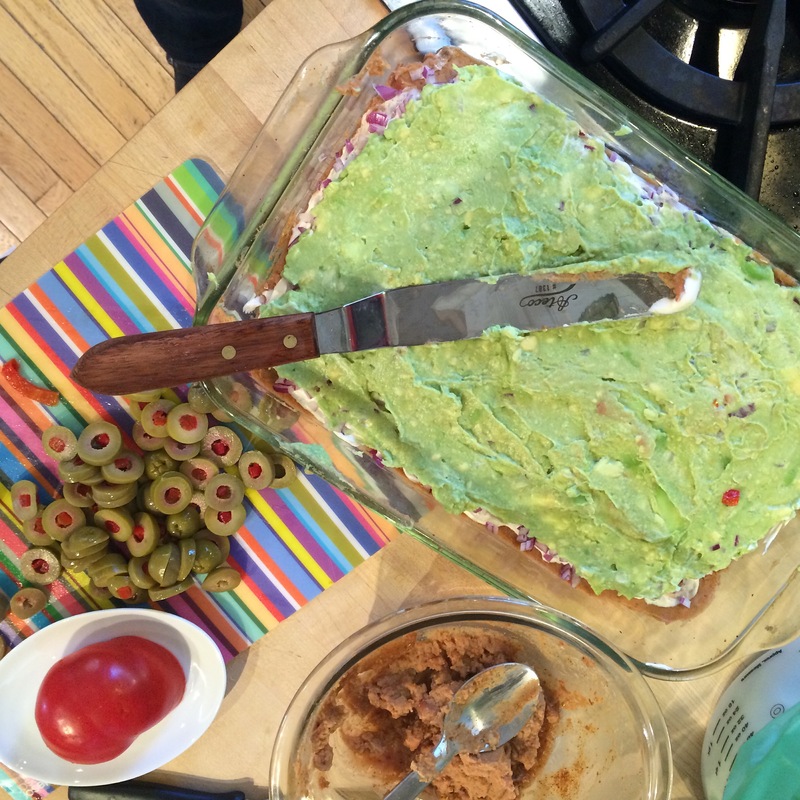 The classic Seven Layer Dip is topped with sliced olives. For summer parties, I refresh the dish with hummus and fresh corn. No matter how I serve it, the entire dish disappears every time. The joy of this dish is its simplicity – open some packages and chop a few veggies – and I get recipe requests every time I serve it. Here is the summer version. Using a spatula, gently mix hummus with taco seasoning mix, then evenly spread hummus into a glass lasagna pan or serving platter. If the hummus is a bit too thick for easy spreading, mix in a tablespoon at a time of olive oil or vegetable stock until pliant. In a medium bowl, mash avocado with garlic salt and lemon juice. Spread avocado mixture over hummus, leaving the edges of the beans showing. Spread sour cream over the avocado layer leaving the edge of the avocado showing. Sprinkle onion and tomato evenly over sour cream, then top with the cabbage. Top cabbage with corn placed in a thick line down the middle.